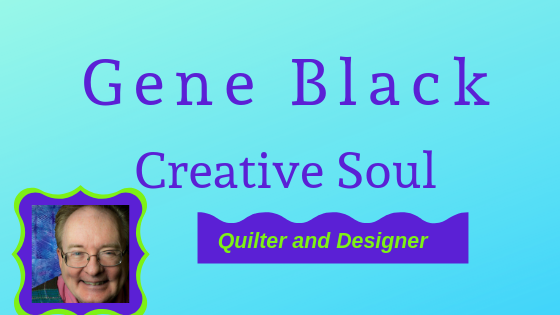 Gene Black an Alabama Artist and Quilter: What a couple of days! Yesterday and today have been "interesting. " So I haven't gotten anything new to show. So what happened? Yesterday started out great. My boss, a co-worker and I went on a "road trip." We were serving as technical assistance for one of our partner agencies. We were supposed to go for a tour and make suggestions. Then we were going back to the office. Sounds like a good day, huh? Yeah I thought so too. A day out of the office is usually enjoyable work. 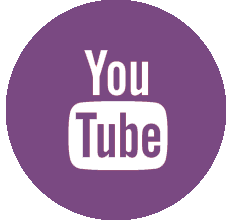 We were asked to help with a few extra things, which is all a part of what we do. So we said "Sure, glad to help." Lunch time rolled around and we decided to all go out to lunch together. I was riding with out partner agency rep and my boss and co-worker were going in the bosses car. We left the parking lot and got down the road a piece (that is southern for a short distance.) The cell phone rang. "Help, can y'all come back and jump us off, my car won't start." We went back, hooked up the jumper cables and tried. Bosses car made not a sound. No "errrr errr errrrrr;" no "click click click" NOTHING. We decided to load up in the one good car and go to eat. When we got back a little more diagnosis made us sure it wasn't the battery. So the boss called AAA to send help. It turned out to be the starter. It was no longer serviceable. So they towed it to the shop and replaced the starter. Did I mention that we were almost two hours drive from the office? We were very late getting back. I was exhausted - so I was lazy last night. I had plans to come home and get some pictures today while there was still light and post them. I fired up the computer and realized - no internet! Yikes! After a while on the phone with my provider we tracked it down to a bad ethernet cable. Lucky me, I am a geek so I had a spare. However, now the decent light is gone. All I had to show is a section of quilt that is quilted. It is the tumbler quilt I posted this past weekend. You will see that another day. Today you get some art to enjoy (I hope.) I am sharing a piece that was on a card I sent with an order from my Etsy store to one of my darling blog readers. 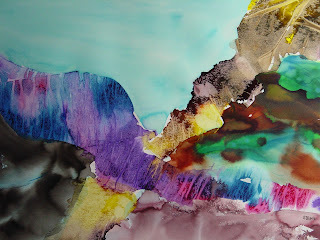 This is an abstract landscape done in acrylic inks. The original was sold several years ago, but as the artist I retain the right to sell prints. I love doing this type of abstract landscape. I hope you enjoy viewing it. It's been a roller coaster here, too....looks like we may lose our biggest customer, and after work we tried to repair our farm tractor -- and broke something else. Sigh. Maybe tomorrow will be a brighter day! LOL It will all work out OK in the end! Gene, I hope you are rested up (Texas slang)!! As always, your art work is outstanding!! Limited Edition and a signature. I'm getting this card framed!! YOu know how much I enjoy your pictures.....just love them. That made for a long day, I would have just done nothing too..what...oh...I do nothing alot of the times...yep!! I saw your beautiful artwork on BillieBee's page! There's nothing like creating something beautiful to take you away from the hectic-ness of everyday life! Lovely art. It's been a weird few days here as well. Hope things are looking up (northern slang for "getting better"!!!) for you today. Days like that are a bit annoying, aren't they?